The Legislative Reapportionment Commission held a public hearing to allow concerned citizens, like myself, an opportunity to provide the commission with pre-map feedback. Seizing the moment, I offered the following testimony. It offers an excellent overview of the Holt Proposal. Below are a copy of my submitted remarks. In my video testimony, I reference the Holt Legislative Proposal PDF. For a quick overview, see the posts with Comparison Maps, Senate Overview, or House Overview. Full testimony from the public hearings is available from the Legislative Commission for Allentown and Pittsburgh (part 1, part 2). 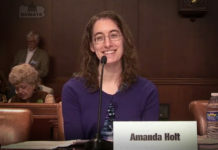 The Holt Proposal actually addressed the concerns of many others who also testified. Pittsburgh Ward 19 / House District 22 (7 testifiers) — keep one district (preferably 22). Redistricting often seems plagued by partisan activities and biased decisions. Discussions on this issue often sink into a battle between two political parties. The casualties of this conflict are the people they will represent and the constitution they are to uphold. In Lehigh County, where I live, there are many odd divisions of General Assembly districts which caused me to wonder if the law really required all these splits. In talking with family and friends living across the state, their areas also had splits that seemed illogical and promoted a poor representation of their areas. The PA Constitution states that no county, city, incorporated town, borough, township or ward shall be divided unless absolutely necessary” and that districts are to be “as nearly equal in population as practicable.” The US Supreme court ruled that a 10% variant is permissible for the purpose of fulfilling constitutional requirements like the one in PA. Recent judicial rulings continue to prove that the 10% variant is still allowable, provided it is used to keep political subdivisions whole and not used to systematically adjust the presence of political parties in a district. Idaho, New Hampshire, and New York all had high variants (in the 9% range) which were upheld in higher courts in the 2001 redistricting cycle. Further study revealed a method that is non-partisan and impartial which achieves equal population (as defined by the Supreme Court) with minimal splits to counties, municipalities, etc. (as required by PA Constitution). The steps of this method are illustrated on the following pages for both the Senate and House districts. The only considerations used were population totals and political subdivisions. The method leaves out the data that causes a more partisan and biased view of redistricting (like the residence of incumbents, prior district boundaries, political affiliation of residents, etc.). Page 4 your packet shows the results for the Senate districts. The column labeled “District Sizes” shows that they are within the allowable variant range. The column labeled “Boundary Splits” illustrates that the variant was used for the proper purpose (keeping political subdivisions whole, as required by our constitution). Page 6 of your packet illustrates the same thing, except with the House districts. Page 8 provides the specific steps used to reach this result, with illustrations of each step on the subsequent pages. Page 11 and 14 discuss how this process created the required minority-majority districts (in compliance with VRA laws and judicial rulings). Close-ups of the House district maps are on pages 16-19. As you can see, it is possible to create districts that are as nearly equal in population as practicable (within the 10% variant range) while still keeping political subdivisions whole. They are compact and contiguous districts that offer the unified representation our founders considered so fundamental to serving the citizens of this great Commonwealth. Each map proves that the impartial system proposed here offers a non-partisan way to create General Assembly districts. It gives the framework necessary to respect and protect the boundaries of political subdivisions while still adhering to the other applicable laws. Many consider a redistricting plan to be superior when it achieves equal district sizes while still preserving local political subdivisions. Pennsylvania has an opportunity for greatness. It is my hope that this Commission will seize this moment and chose the superior way. [Video] Redistricting & The Big Game: What is fair? [VIDEO] Why are Measurable Standards Needed in Redistricting?